Well my day started with part of my shirt getting caught in my car door as i was getting out to go to work - so there i was with my shirt stuck in the actual lock so i could not open the door and could not move! Hilarious - i finally jiggled the key in the lock a bit and wrangled free, although with a few tiny wholes in my top! Oh well - at least my client did not see me stuck to my car or worse yet i did not have to call anyone to rescue me!!! Anyway - here are a few photos of some of my MLS favorites...hope you enjoy! My Little Shoebox Challenge - FARMERS MARKET! 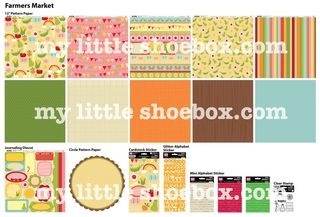 We have a really fun new challenge going on with the Farmers Market line at My Little Shoebox ! Click on the My Little Shoebox link to see how to enter and WIN! This line is so cute and full of creative possibilities - I'll be posting my creations in the next day or so! Start scrapping and enter to win lots of MLS goodies! What a week - things were already a little crazy after returning from 8 days away and dealing with a house in total disarray from a little flood in our house...but to top it off my laptop crashed Tuesday night. I spent a few totally unproductive days with no laptop and as much as i love my iPad, I simply cannot do my job from it! Now i have a new laptop (a very good thing) however I've lost all my old emails (by old i mean prior to March 30th!). We're still trying to recover them so i am holding out hope! I tried to scrap last night but spent most of the night chatting, shopping, catching up and snacking! It was mad fun but did not finish one thing! Today I've been taking care of sickies, trying to create some order in this house, and trying to make some design changes to my blog (still trying)! My Little Shoebox - DT!!! I am so very excited and honored to be a part of the MLS Design Team! I cannot wait to get to work on projects using the new MLS lines like Home Tweet Home and Sew Cute! I was hoping to get started tonight however jet lag has taken over my mind and my body and i think i need sleep! Just returned from 8 days in Hawaii - which admittedly sounds awesome, however i was working most of the time and never even stepped onto the beach! The last few days were spectacular though - a little bit of time for R&R, great food and drink and wonderful friendships! Hopefully I'll get some sleep and can start to play with all my new MLS goodies tomorrow!